WhatsApp business has been launched and now anyone having a business can install it on their smartphones with the WhatsApp messenger app. The WhatsApp Business app is designed to help small business owners in quickly communicating with their customers whenever they want. With the launch of this commercial business app, the business owners can now engage in one to one chat conversation with their customers. Its a convenient app for business automation as the owners no longer need to send SMS messages to their customers. They will install this newly launched business app instead. The reason is that the app is totally free and have great features as compared to SMS messages. So, SMS messages may soon become obsolete in case of business marketing automation solutions. One thing to note here is that you can now officially run two WhatsApp accounts on the same android phone. But for this, you should have separate mobile numbers for both the apps. It is not recommended that you migrate your existing number to WhatsApp Business app. Because it requires a lot of work like backing up chat history and then restoring it to the new app. Also, your normal WhatsApp app will also not work with that business number. So if you are going to install WhatsApp Business on your android phone then make sure you have a fresh and new mobile number ready. If you don't have a new number and your regular WhatsApp number is already a business number then migrating it to the newer app will be a good idea. But you have to backup and restore your chat history to the WhatsApp Business app. If you don't care about chat history from the regular WhatsApp then you can skip the chat backup and restore. 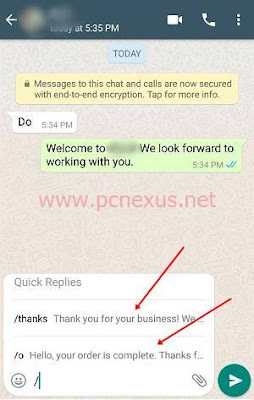 We will also share an article about migrating WhatsApp chat history to WhatsApp Business later. We have wrote this article and you can check it below. Download and install the WhatsApp Business app from play store. 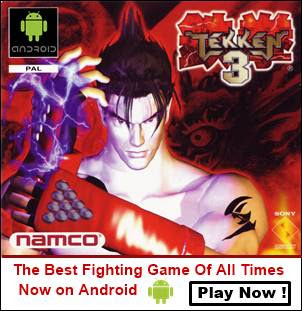 Open it and tap "AGREE AND CONTINUE". The app will ask to access your contacts. Tap 'CONTINUE' to give permission. Now enter the number that you want to register as a business. Then tap 'NEXT'. Now you have to verify that number. You will receive a verification code on the number that you entered. Enter this code in the app to verify. 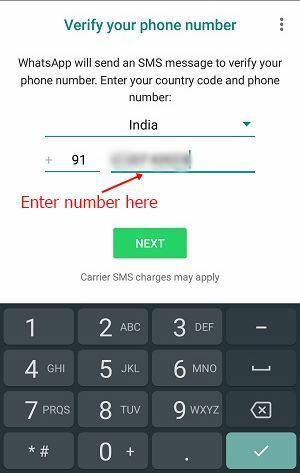 The app will auto verify your number if the SIM is active on your phone in any slot. In this step, you have to enter the name of your business. Enter the name carefully as you won't be allowed to change it later. ➜ After few seconds the app will finish the setup and open the chat window. You can use this new app just like you use the regular WhatsApp. But it has some extra features that we are going to discuss here. Now after the initial setup, you just have to add details of your business in the app. So that the users can easily find your email, phone numbers, website, working hours, and address. To add these details follow the steps below. Open the app and tap the options menu on the top right corner (three vertical dots) and tap 'Settings'. Here tap 'Business settings' and then tap 'Profile'. Here you can add your store or office address, add a profile picture, select business category, add working hours, email, and website. Scroll down and tap 'Business hours' and then tap 'Schedule'. Select an option that best describes your working schedule. 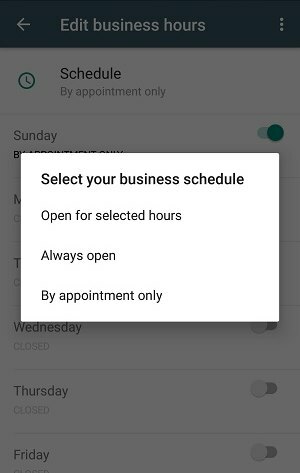 You can select a business schedule from 'Open for selected hours', 'Always open', and 'By appointments only'. Here I have selected 'Open for select hours'. Now the app will show you the list of all seven days. Just enable the day on which your business is open. Then enter the set of hours. By default it is set to 9:00 AM to 6:00 PM but you can change it as per your schedule. Most of the businesses remain closed on Sunday so I won't be enabling that day in my business schedule. This will let our customers know that we don't trade on Sunday. However, you can select any day as per your schedule to set it as an off day. After setting the working hours just go back to the profile and finally, tap 'SAVE' in the top right corner. It's just that simple. Now your customers can easily find your business details. WhatsApp Business provides three types of messaging tools. 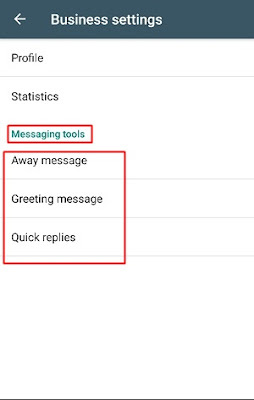 These are 'Away message', 'Greeting message', and 'Quick replies'. Lets check what are these and how to use them. Away message: The Away message will notify your customers that you are currently not available to chat. 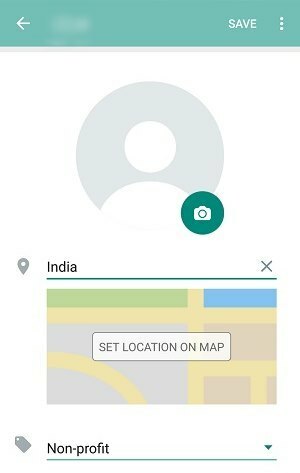 When you are offline or its an business off day like Sunday then if a user sends a message to you then the WhatsApp Business app will automatically send a message to the user notifying time that you aren't available and will reply soon. Simply go to 'Settings>Business settings>Messaging tools>Away message'. Here enable the 'Send away message' option first. Now under the 'Message' option, you will see a default message. If you want to change it and add your own away message then tap the 'Edit' button, the pencil icon next to the message. Enter your custom away message, you can also add emoticons to your away message. Under 'Schedule' you will have three options. Their description is as follows. 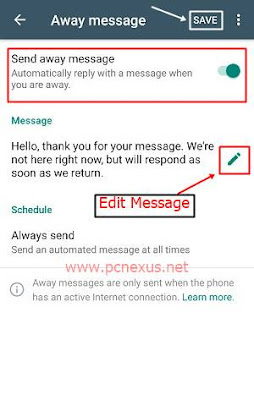 Always send: The away message will be sent at all times whenever a customer sends a message and you are not online. Custom schedule: Only send automated away message during specified times. Outside of business hours: Send automated away message outside of working hours. Select an appropriate option and then tap the 'SAVE' button in the top right corner. Note: The away message will only be sent if the internet is active on the owner's android phone. 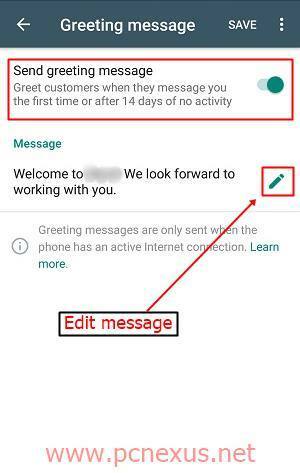 ➜ Greeting message: Whenever a customer contacts you first time then the WhatsApp Business app can send an automated greeting message to him/her. Simply find the 'Greeting message' below the 'Away message' and tap it. Here enable 'Send greeting message'. Under 'Message' tap the edit icon otherwise leave the message to default. You can type the greeting message in any language. Just check your phone's keyboard for language selection. Select the language on your phone's keyboard and type the message. Finally, tap 'SAVE'. ➜ Quick Replies: This option is located below the 'Greeting message' option. With quick replies you can quickly send a pre-configured message with a single press of a button on your phone's keyboard. Simply tap the 'Quick replies' top open it. 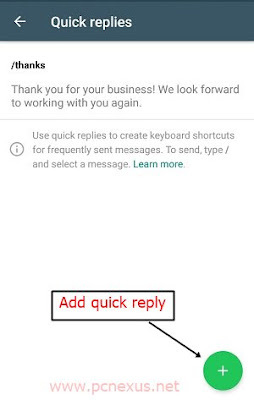 You will see a default quick reply as '/thanks' and a message below it. Here '/thanks' is the shortcut to the message below it. You can just type '/thanks' in your chat and the message will be added automatically to the chat. The command for adding quick replies in a chat is /shortcut. Where 'shortcut' is the symbol that you set for your quick reply message. To add your own 'Quick reply' simply tap the 'plus' button at the bottom right corner. In 'Message' filed type your message with or without emoticons. Under 'Shortcut' add a letter, number, or a special character. Every shortcut will have a forward slash before it. A forward slash lets the app know that you are using quick replies in the chat. Without the forward slash, the quick replies won't work. When you type a forward slash in a chat then the quick replies suggestions will appear. Business owners can assign labels to their customers' chats. This will help the owners in uniquely identifying their customers. Like if a new customer signs up then it would be better to label it as a new customer. If a customer has pending payment then we can label it as 'Payment pending' as this will remind us that the customer hasn't paid yet and payment is still pending. If a customer's order is completed then labeling it as 'Order complete' will be a good idea to prevent confusion with other customers. So this way, we can categorize our customers and keep a record of new customer, new order, a pending payment, or anything else. 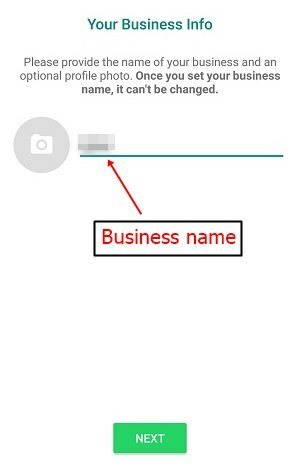 To apply a label to a customer's chat simply open the main chat window in the WhatsApp Business app. Long tap the chat that you want to label. Then tap the label button just next to the archive button. 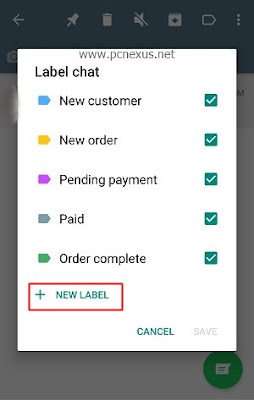 You can apply multiple labels to a single user chat like 'New customer', 'New Order', 'Pending payment', 'Paid', and 'Order complete'. These are default labels. To add your own label just tap the '+NEW LABEL' button. 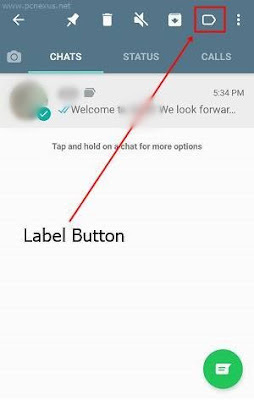 ➜ To check for labels for a particular chat just tap the profile picture of that user in the main chat window. All labels will be visible below the profile picture. To see more labels just swipe left over the labels. 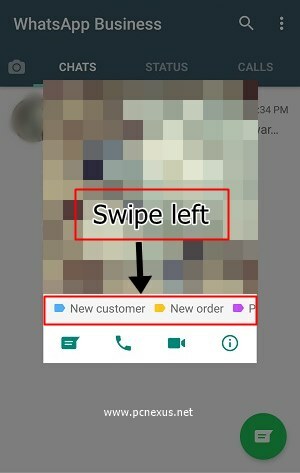 So this is a detailed article on installing and setting up the WhatsApp Business app. The article explains the unique features of this new app that aren't available in the regular version of WhatsApp. We can say that the regular WhatsApp is a subset of the WhatsApp Business app. The business version has all the features of the regular messenger app. However, the WhatsApp Payment service is still not available. We will see it soon in few months. After that WhatsApp can be used to send or receive payments. If you have a business then just register for an account and start communicating with your customers in an interactive way. I think with the advent of this new business communication app the SMS messages will go obsolete in few years. Also if you don't have a budget to build an app for your business then use the WhatsApp Business app for the time being.